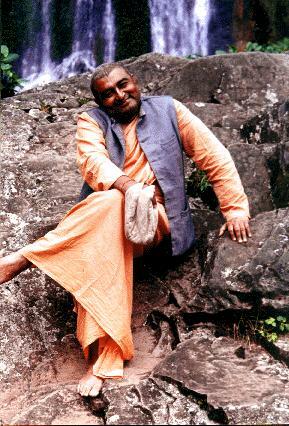 "I want to be always united with the service of my Sannyas Guru and the founder of the Vrinda family. 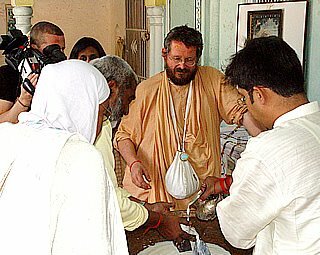 To conduct missionary activities and organising the devotional service in the new Vaisnava communities is very difficult. Therefore we have to work together very closely. 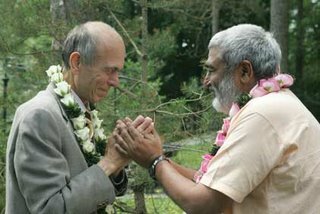 If my Hari nam students want to increase their service connection they should come for second initiation and leadership training to Srila Guru Maharaj or to their local mission leader if they are in another Vaisnava mission". 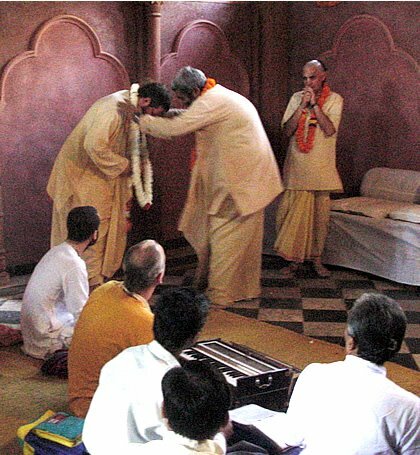 After many years of preaching all over the world Sripad Sadhu Maharaj started to help his sannyas guru and founder acharya of VRINDA Sripad Paramadvaiti Swami, by giving Hari Nama Ritvik initiations on his behalf in the holy name of Krishna as he visits the Vrinda centers around the world. With the blessing of his Sannyas Guru Sadhu Maharaj is also visiting other Vaisnava missions and opening new areas spreading the message of Prema bhakti pure love for God. There he also started to give Hari Nam initiation to those who have faith in him. All devotees feel so happy to meet with him. His love, his wisdom, his smile and his care for all has gained him a place in many hearts permanently. 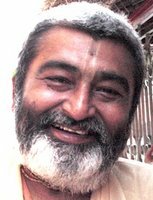 Sadhu Maharaj has already many invitations and not enough time to attend all. Those devotees who would like to join the VRINDA family and also help in our many projects in India are invited to please come to our kartik functions. My Guru Maharaj, Sripad Paramadvaiti Maharaj says: "Sadhu Maharaj is very dear to me, he remembered that he was told by Srila Prabhupad to preach all over the world. I'm so happy that he came to join Srila Prabhupad's Mission in our VRINDA Family". Bhakti Vedanta Sadhu Maharaj became a Tridandi-Bikshu, a member of the renounced order of life. He has travelled several times around the world to distribute the love for Shri Shri Radha Govinda to one and all. 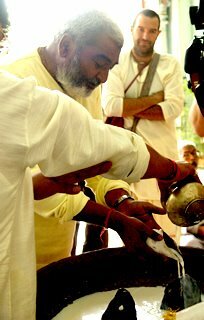 Sadhu Maharaj who is also my father in this world, was educated in the royal surroundings of the vaishnava king Sir Raghunandan Prashad Singh and spend every year a lot of time in the beautiful Munger Mandir in Shri Vrindavan Dham. My two brothers are in America, and my sister and me as well as my brother and also 'godbrother' Naveen Krishna are here in India. Sadhu Maharaj has taken us to our Guru Maharaj Srila Paramadvaiti Maharaj and he has requested us to look after the worship of our Isth-Dev Shri Shri Radha Mohan and turn our fore-fathers temple into a centre of Vaishnava learning. You can help our projects. I'm married in Calcutta. My two daugthers are assisting college overthere, under the care of my husbad's family. At present I'm attending our temple in Vrindavan, which my revered father Shripad Sadhu Maharaj entrusted to me, for this periode of managment emergency. As temple president I'm managing to my best the worship, kirtan, and guest house, for the pleasure of Guru and Vaishnavas and our Istha-dev Shri Shri Radha Mohan. And as a mother I'm caring of the first schooling years of my son Ayan. Jay Gurudev! Jay Nitai Gaur! 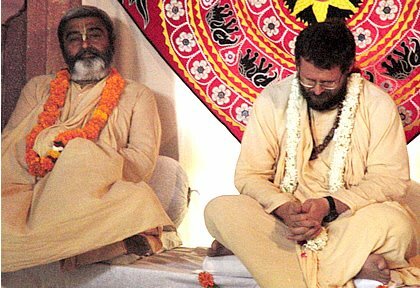 Jay Radha Mohan! Wishing all divine blessings to be with you!